Some analysts have said the market is carving out a top. Dominic Cimino of Preferred Planing Concepts says these analysts could be right but they could also be wrong. He points to the S&P 500 and its “major, minor, and minor-minor bullish trend channel”. The S&P 500 is above the support level i.e. the minor-minor trend line. The Russell 2000 and Dow Jones Transportation Average index charts are also above their support levels. Most financial media are focused on reporting about trading, stock moves, and analyst recommendations. Josh Brown says there are about 3 million investors that actively trade their own stocks, and need this kind of news. Millionaire households which total about 8.6 million want news on long-term planning instead. In 1996, Federal Reserve Chairman Alan Greenspan asked, “But how do we know when irrational exuberance has unduly escalated asset values?” Pimco’s Bill Gross has begun his latest investment letter with that quote in discussing expensive assets. He says on a scale of 1 – 10 in “measuring asset price irrationality, we’re probably at six and moving upward”. He says returns on junk bonds will be low. Given that junk bond spreads correlate with stock prices, he argues that we’re not seeing a bubble but that the stock market is nevertheless expensive. He says with the returns on both stocks and junk bonds being influenced by the Fed’s easy money policy, investors should “temper their enthusiasm” when that support weakens or goes away. 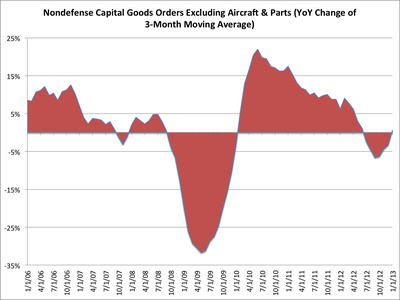 David Rosenberg considers the three-month moving average of non-defence capital goods orders excluding aircraft to be a key insight into what businesses are doing with their cash. He said when this went negative it signaled a recession. Today, Rosenberg’s recession indicator finally moved into positive territory. Traditional financial advisors are feeling threatened by online competitors. But Adam Kuettel of NWA Financial Partners told The Wall Street Journal, that they needn’t be threatened just by the presence of online advisors. Instead he says the real threat to traditional advisors comes from firms that are willing to add on these services along with traditional advisor practices. This includes firms like Edelman Online the online presence of Edelman Financial Services and Merrill Edge, the online arm of Merrill Lynch.